is it the right colour 4 days out? Well after our dodgy and unsure start, we are in the gate! My apologies to Lefty for causing him the stress of flying over to an uncertain outcome, but now the job is done. I didn't do a wash up of the last test, but if i had to sum it up in as few words as possible, i'd say, "Thank you Cameron Sutherland!" A great test track, that had everyone -including the Poms- say it. Now the issue of the team selection for Melbourne- what a dilema! With the ball, no one did anything that puts them in the, "please take a seat, mate" catagory. Hey-Diddle didn't get wickets, but was tight and applied the torniquet, Hilf was much the same, and Jono and Rino were very very good. So, does the G need a spinner? i like beer at the G, but would be prepared to give up Beer for the test. Hauritz with another century must be... well, we all know what he thinks his chances are. Pontings finger must be giving Kwahaja (must learn to spell that! )the drools. Will he, won't he? Punter has a habit of missing the od Boxing day, given i think it is his last chance, i doubt he will miss out this time. Short and sweet today- there are many more things to be covered, but i need to do that which i'm paid for! ps. who says you can't win a test with only 3 batsman... as long as you can get 20 wickets! On behalf of all the DTW crew I will say a resounding THANK YOU to Stoph. Where would we be without his dedication to the task? We would be kiltless and ticketless is where we would be. And now for the test side. I don't think the selectors can afford to change a winning side. Apart from the Ponting injury I can't see a change. Smith can roll it over if the quicks need a break and Watson can provide some more variation. 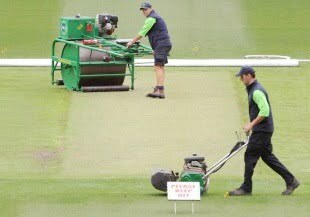 The pitch looks like it could have something in it for the bowlers so four quicks is the go for me. Siddle on a home track in front of his adoring fans will be good for cricket. I look forward to the endless chant "We love him cos he's a Victorian" ringing out among the punters. It is almost guaranteed that Australia will bat first. Strauss has had some good results bowling at us first and I think if he wins the toss he will bowl and Ponting will bat. The stage is set for our captain and vice to stand up and be counted on the biggest stage of all. It's Boxing Day and it's DONKEY KONG!!! thank you Nos, i do wear the label of AWESOME rather well i think! Yep, we're in and the most important thing is that kilts will be represented at Boxing Day. Of equal importance is the fact we'll be the ones wearing them! Thanks so much Stoph (and Sie) for doing the hard yards; lovely messages to wake up to on phone and email. I was watching highlights yesterday and I must admit it was a little blast from the past sort of thing watching Aus quicks bouncing the English. Of course Johnson's wickets were via the channel thudding into pads but all up it was such aggressive bowling. The commentary prior to Siddle's wicket of Prior in the 1st dig was all about how bouncing was fine but it wasn't going to get a wicket and very next ball Prior played onto his stumps. The key was that Siddle was executing a clear plan and Prior really wasn't comfortable with it - especially with a short leg - and it brought his demise. The MCG will be so unlike the WACA that it will be like going from marrying your sweetheart to marrying your cousin. You don't really want to but you're living in Tasmania so what are you going to do? Unfortunately with the drop in pitch the G is the worst test wicket in the country - as voted by test players - slow, little bounce and carry and not developing into a turner on the 4th and 5th day. The atmosphere of the ground in a way makes up for this and the huge space provides batsmen with loads of 2s and 3s to make up for the ball not coming onto the bat as it does in places like the WACA and Adel. I'd actually go with the same side and develop a plan around the 4 main quicks. I doubt Beer will get you 5 2nd innings wickets which a spinner should be picked to do. If he's picked to give the quicks a break then you're wasting a spot. If selectors are adamant that Hauritz is a no-go zone then give Smith a chance to show his wares. I don't think England will bat that poorly again. Bell will be moved up the order and looked awesome while apart from Collingwood every top order bat has made runs in the tests. Aus, on the other hand, are being carried batting-wise by 3 players. Clarke's back is not good; one of his first shots in the 2nd dig at the WACA was a pull where he could barely rotate with the shot. Ponting will play but with a very busted finger; on the top hand as well. Whoever wins the toss will bat. The pitch won't be a green-top so the normal course of events will transpire. Get runs on the board to bowl to and then blast them out for a lead of over 100. Great test for Hughes and Smith here with less bounce (may help Smith but not Hughes) and little movement off the seam (will help both). ...just want to put out a big thumbs up to the MCC- the coms coordinator Katy was the only person to respond to my (15 odd) grovelling and rather pathetic emails to media, MCG, CV and CA. while she had no tickets to give, she gave me a heads up to todays sales so thanks Katy, you are a champ. I think Swann may feature a bit more at the G. He's too good a bowler to have missed out so much so far. My prediction is more of a hope as I'm worried England will play negative cricket. Partly because I think Strauss is conservative and the English still play too much 'draw' cricket, and partly because Aus should go all out right from the start seeking a positive result. If Aus get the upper hand I expect to see England quickly revert to damage control and try for a drawn series. This could mean a fairly dull test but, for the reasons we all love cricket, it could the opposite way. England obviously have everything to play for as if they win, the Ashes are theirs. Aus therefore cannot afford to lose and so may have to risk losing to win. This is so well set up both for the test and the series! Happy for the unwashed to play conservative, will fall into a trap if they do. Same team should be used, Watson can relieve as well as smith if needed to rest bowlers. Good on Katy for giving the heads up, but I did have you covered even if she didn't come through Stoph. Hoping we have 13+ ickets on the first day....Australia are a better chance of winning a low scoring game....not much chance of beating them batting once! Cannot wait to get there for the start of play as well as cheering on Nos during his competition. As a wise man said: "It's on like Donkey Kong". yep, full cred for the tidy backing up Sledgey. sorry, forgot to give you a shout out- ya big lug! Strauss wins and says, "i won't do that again- we'll bat!" Paul ejected by 4:10 on B-day. Just found out my comp starts at 8.30am. It includes breakfast too. Apparently you guys are welcome to watch and one of you can eat too. They don't call me 'Wristy Woody' for nothing Nos! You guys might remember I was incredulous at the fact that general admission received no options for seating at the Adelaide Oval. You also might not remember that I was incredulous at anything. Anyway I said I'd write to SACA and below is the letter. Thought you may be interested. Hi there, I'd like to take this opportunity to make a comment about general admission to Adelaide Oval for the recent test match. To be clear about my position and intent, I am fortunate to have been recently granted membership to SACA and relish the opportunity to be a part of cricket in this state. More than just a spectator, I'd like to be involved in cricket administration and specifically increasing Aboriginal participation and further developing the women's game. I hope this point demonstrates in at least a small way that my intentions outlined in this letter and inherent of my membership are honest and well-meaning. Adelaide Oval is quite unique and Adelaide is privileged to have her. One of the most vital aspects to the success Adelaide Oval has garnered over many years is the accessibility it provides. This is more than just location but also affordability. I believe that viewing sport should be accessible to the masses and the price of general admission represents a fair cost in my opinion. However, what I found disappointing when attending the test with friends from Melbourne (on general admission tickets) was that there was not a single seat available for those entering via general admission. While I appreciate the fact the huge developments Adelaide Oval has undergone (in my opinion incredibly successfully) carry equally huge costs with them; thereby requiring financial contribution from public, government and the private sector, I believe it is just and fair that people attending the cricket on a general admission ticket can have access to seating. Clearly this would only be possible on a 'first in first served' basis with no option for reserving seats and seat availability may only be 10% of total general admission. However, many people are already financially stretched and want to see at least 1 day of the annual test. I believe they should have the option of getting to the ground as gates open to find themselves a seat for themselves and family. Many people will elect to stand on the hill in any case but making any and all seats only available to members or to people who can afford higher priced tickets, in my opinion, demonstrates a level of greed. As I'm sure you will appreciate, taking one's family to the cricket is not a 'cheap' exercise so is it not fair to offer a small level of comfort to those who will greatly appreciate it? I would like to stress that I believe we have a magnificent oval in Adelaide which provides spectators with one of the best views of the live action in the world. I feel privileged to be a member of SACA and am grateful my wait for membership was relatively brief. My concern relates to those less fortunate than I who also share a love for cricket but may not be in a position to afford membership as I am lucky to. Eloquent and to the point Lefty. I suppose they could argue that you can, and some do sit on the grass. Except when late comers think it's alright to stand right in front of you as they squeeze into the marked off area. That is what pissed me off more than anything. How the hell can someone stroll in late and notice everyone behind them is sitting down, yet remain standing? FACE DOWN DRAGGING is a term that gets a workout in my vernacular but I think it can aptly be applied here. very eloquent and articulate Lefty- up front honest and relevant... i'm running out of adjectives! after careful consideration regarding MCC membrship, i decided i was of improper character and denied myself the opportunity! I had thought of the grass idea but imagine being a couple of 65 year olds with your grandkids, or you've got a bad back/legs. Really there's the 'family section' grass and then the hill with a bit next to that - which people stand up in! Compare that with other Aus grounds and we start to look pretty greedy here. Membership used to be decades of waiting so thank christ for the new stand!